Many have pointed to the recent cold winter temperatures – particularly in the American Northeast and Midwest, as disproving the very imminent threats of global warming. Yet, these symptoms are actually directly related to the problem – as winter storms move further south, and Arctic ice diminishes, allowing cold winds to move freely. These temperatures have even correlated with the loss of ice in the Arctic Sea. While ice has disappeared from the Arctic at a consistently steady pace, the remaining ice is also becoming significantly thinner than normal – making it more prone to melting. At risk are not only the local ecosystems – something evidenced by the release of gases from thawing permafrost in Russia, but also shipping routes and routine ocean and atmospheric patterns. Even an event like the distant Arctic melting can have serious economic implications for everyone else. The newest data has been gathered from a myriad of sources — Navy submarines as well as weather satellites — and points to the fact that the rate of thinning is occurring much more swiftly than what climate models have proposed, as indicated by an ambitious study seeking to draw a link between the wide variety of data. 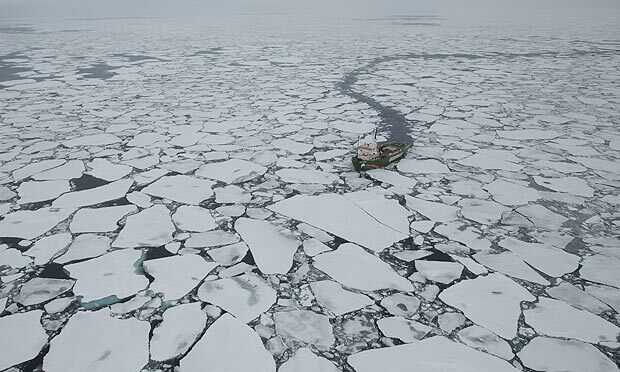 Researchers of the University of Washington Ron Lindsay and Axel Schweiger have calculated that within the Arctic Ocean’s central basin, the sea ice has shown a massive decline – thinning by about 65 percent since 1975. During September, the end of summer, at which point the ice is typically at its minimum levels for the year, ice thickness has been observed receding by an overwhelming 85 percent. While the results hardly come as much surprise to those who have long accepted the science behind anthropogenic climate change, this information is crucial in one particular way. By next century, when temperatures are expected to rise by an estimate of 33.5 degrees Fahrenheit, parts of the Arctic may actually be free of ice – at least at certain times of the year. The extent of ice lost has been readily available by NASA and NOAA weather satellites, but the particular thickness has not always been easy to measure. Knowledge of the ice volume might be of more immediate value when it comes to predicting the decline of ice as it varies depending on its proximity to the sea. It may be affected by not just overall surface temperatures, but also the temperature of the water as well. Although submarines as well as boats and helicopter missions take measurement of ice volume, along with some satellites already in space, each utilizes a different method of measurement, and getting the data to sync up is sometimes frustratingly difficult. The ESA’s Cryosat 2 for example, uses radar for measuring, while NASA’s ICESat used laser impulses to study the free flow of water through the Arctic in order to calculate volume. Their most shocking discovery when all the measurements were put together: On average, sea ice across the Arctic basin has decreased by about 18 inches per decade since the turn of the 21st century. Since the earliest of the measurements taken in 1975, the annual average thickness in only the Arctic basin’s central portion declined from about 11 feet to only four feet — indicating an overall 65 percent decrease. Worse, this decline is almost double of the 36 percent decrease that a previous study had recorded between 1975-2000. Although this new estimate of sea ice thinning which Lindsay and Schweiger described in the journal The Cryosphere, is far more dramatic than the projections of most climate models, Lindsay does agree that our current models do a reasonably decent job in predicting the loss of ice. Julienne Stroeve, a sea ice researcher with the National Snow and Ice Data Center in Boulder, Colo., who was not involved with the research said in an email, “It would be great to have a long-term sea ice thickness dataset,” reminiscent of the the one pieced together by Lindsay and Schweiger, but the data is not without inherent, sometimes varying biases, meaning that often conclusions resulting from data combined in this way is sometimes difficult to trust. In their paper, Lindsay and Schweiger fully acknowledge the potential errors that can be made from combining the data in such a way.